Yes! Another wacky cake! I’m on a roll. 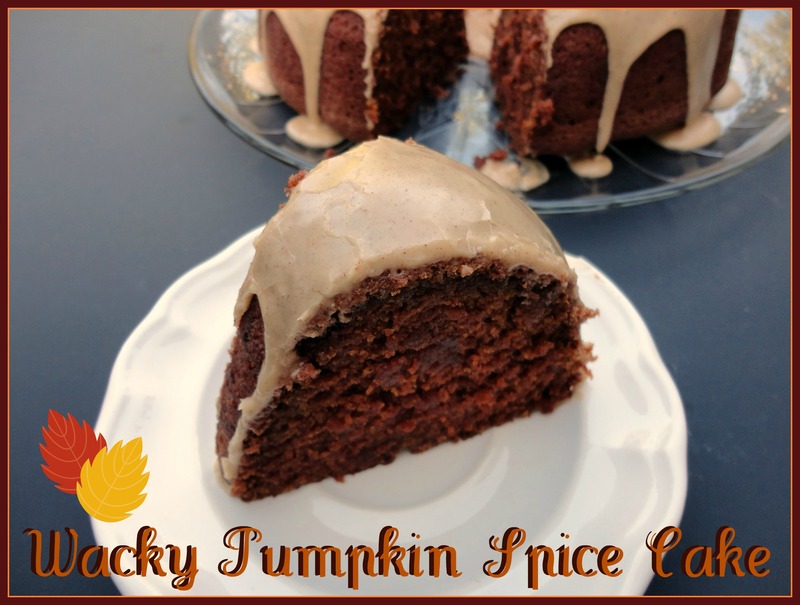 :) (If you’re new to my blog and have no idea what a wacky cake is, I explain that here.) 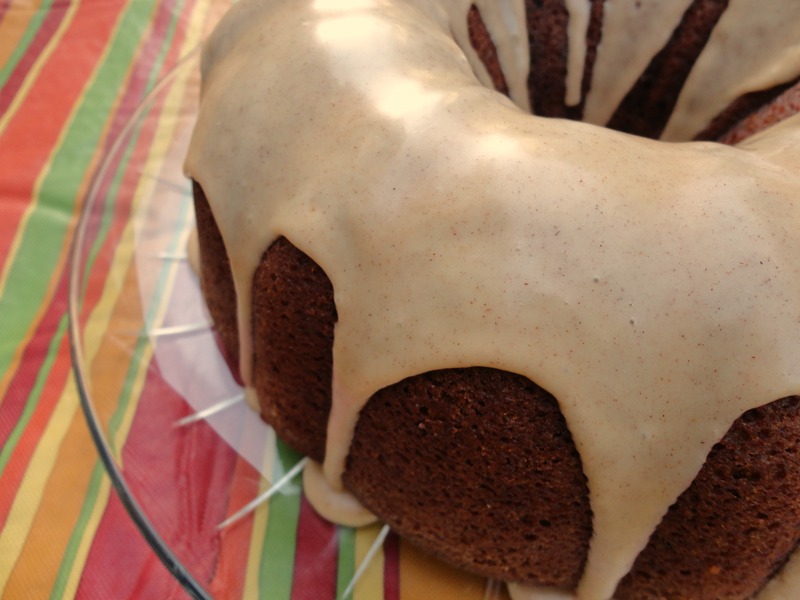 I’ve been hanging onto a Wacky Spice Cake recipe that my friend, Rhonda, shared with me two years ago. I kept forgetting about it until mid-summer, for some odd reason, when spice cake was the last thing I wanted baking in my oven. Thankfully I remembered it on time this year, but I seem to have a problem following recipes exactly and had to add pumpkin. The resulting cake, like any wacky cake, is very moist. And delicious! Preheat oven to 350 degrees. Grease and flour a 10” bundt pan (I used Miracle Pan Release) and set aside. In a large bowl mix together flour, sugar, cocoa, cinnamon, nutmeg, cloves, salt, and baking soda. In a separate bowl, whisk together the pumpkin, water, oil, vinegar, and vanilla. Whisk the wet ingredients into the dry until thoroughly combined. Pour into prepared pan and bake for an hour, or until a toothpick inserted in center comes out clean. Place on a cooling rack and allow the cake to stay in the pan for five minutes, then invert onto cooling rack and allow to cool completely. Once cool, put on a plate, blend the glaze ingredients together and pour over the cake. *Honestly, I have no clue why the cocoa is an ingredient, unless the person that created the recipe wanted it to be a darker spice cake. I will omit this next time because I don’t think it added any flavor, and I prefer my pumpkin cake to look more orange and less dark. If anyone omits it, please let me know your results! Recipe source: adapted from Rhonda C.
Posted in Cake & Frosting, Vegetarian & Vegan and tagged allergy friendly, dairy-free, egg-free. Bookmark the permalink. ps: caramel cake sounds great! I hope you like it! Whole wheat flour seems to absorb more moisture than AP, so you might want to add more oil and/or water, maybe a couple tablespoons or 1/4 cup. You read my mind! I was going to use the vanilla recipe and change it to add pumpkin to it and pair it with a (Tofutti better than) cream cheese frosting. I will try it with your frosting and some “cream cheese” for the kids. Great idea! I recently tried Tofutti for the first time and thought it was suprisingly close to the real thing for not having any dairy in it. You’ve reminded me I need to post the recipe I used it in! Vegan carrot cake protein muffins–they’re SO good! I froze them and even 1 1/2 months later, they’re great. I am passionate about anything pumpkin spice. 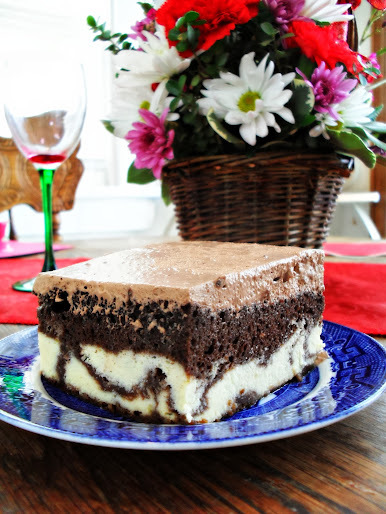 this looks crazy moist and delicious! Oh man . . . at this point I just want to run my finger through the pools of glaze and lick them all up! Where are my eggs? Hee hee, just kidding.. I am so scared to try making a cake without eggs it isn’t funny. It looks incredible though. This cake looks delicous! 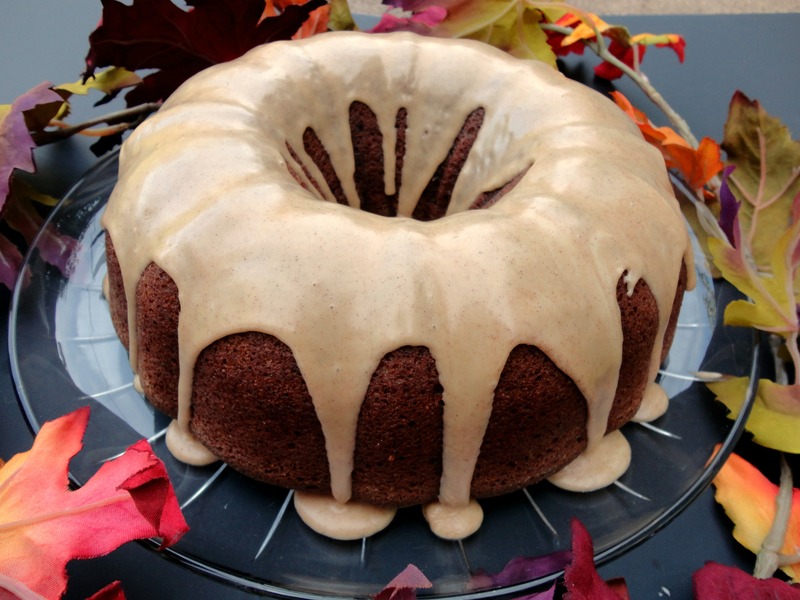 Pumpkin spice cakes are great. I used fresh pumpkin puree instead of canned. Also, instead of 1 1/2 cups of water I used 1 cup of Apple Juice and 1/2 cup of water. Fresh pumpkin and apple juice–fabulous! I took this to work and got amazing reviews! My only problem was that the icing was not thin enough to run down the sides. I had to “frost” the cake with the icing. Should I use more vegetable oil next time? I put it in the microwave for 15 seconds or so and it got more runny, but still not enough. Is microwaving it okay? Thanks! It sounds like there wasn’t enough liquid in your icing, or too much powdered sugar. If you followed the measurements, it could be you have a drier climate than I do–I have no idea why else it would have been so thick. It is fine to microwave, but next time I’d add a little water until it gets glaze consistency. Glad it was a hit! Tried this with whole wheat flour instead of all-purpose and apple sauce instead of vegetable oil using the same measurements of the replacement ingredients, and it was amazing! We also omitted the cocoa and used maple syrup mixed with cinnamon as a glaze. Still perfect! Thank you for the recipe. Thank you for letting me know! I love that you were able to make it healthier and it was still great! Yay! I will do it that way next time too. I made this last night, and it was delicious. I was feeling lazy and didn’t do the high-altitude adjustments that I usually do when baking (I live at 4,500 feet), and the cake still came out nice and moist. Changes I made were to omit the cocoa and reduce the sugar by 1/2 cup. Instead of making the glaze, we paired it with butter pecan soy dream ice cream. With the reduced sugar, the cake was perfect – we could add sweet if we wanted (i.e. ice cream) but it was also not too sweet to eat as pumpkin cake for breakfast this morning. Cocoa is a bitter spice (and usually requires a lot of sugar to counterbalance), so I am guessing that by removing it, you could reduce the sugar without a negative impact. It was devoured by vegans and non-vegans alike! Thanks for the great recipe, Veronica! Okay, I found this via a google search and thanks to the lack of eggs and the comments about whole wheat flour I’ve whisked one up and it’s baking as I type. Had to adjust the spices due to allergies–hence allspice, a touch of molasses and honey. Appreciated all the comments by others who’ve baked this with their variations. Glad to have found your blog! I’ve just recently discovered people can be allergic to cinnamon-I had no idea. I hope your version turns out well! Hi Veronica. Actually I’m allergic to the nutmeg and cloves. So I replaced those with allspice and 1/8 of a teaspoon of cayanne pepper. Yes, just that little amount can pack a nice kick for some tastebuds. I kept the cocoa because sometimes it’s not how the spice operates by itself but how it marries with other spices. Added a teaspoon of molasses and 3 teaspoons of raw honey to moisten the whole wheat flour (Hodgson Mill 50/50 whole wheat & white flour blend) –plus two tablespoons extra water. The cake is DELICIOUS! Dense, heavy and yet moist and tender. Had absolutely no issues with the glaze using your ingredient measurements. Thank you for a great pumpkin cake. Hi! Thank you so much for this recipe! We are constantly looking for vegan/vegetarian recipes, and this was wonderful. I made the cake yesterday for a party, and today my husband requested one he doesn’t have to share. Changes I made: I don’t eat chocolate, so I omitted the cocoa. I used whole wheat flour, and I used honey instead of sugar (2/3 cup for every cup of sugar) because we’re also a sugar-free household. I used apple cider vinegar instead of white vinegar. It was outstanding! I had to reduce the water by 1/2 cup since the honey added moisture, and increase the cooking time to 70 minutes. Everyone LOVED the cake, and asked that we make it for Thanksgiving. Once again, thanks! I’m loving all the comments with changes b/c now I feel like I’m the allrecipes.com site and readers can tweak their own cake based on the reviews! lol! I know I will be! I love that you used honey too-great idea. Refer to the recipe please. Thanks! I just made these tonight, and made the following substitutions: whole wheat pastry flour for all purpose, omitted the cocoa, lessened the sugar to 1.5 cups (i will experiment again with only 1 cup), substituted applesauce for oil, apple cider vinegar for white vinegar, and almond milk for water. They are a huge hit! So good!! I also had the same problem as Mari with the icing. I keep my maple syrup in the fridge, so that might be the problem. I added a Tablespoon of warm water and that did the trick! Brown sugar might change the moisture level (more moist), but hopefully not enough that you’d have to change anything else. Olive oil I’m afraid would not work too well here but let me know how it turns out. Hopefully the pumpkin and spices overpower any flavor of the oil. Turned out as a flat cake…. The baking soda and vinegar are what makes it rise so be sure not to leave those out. I love that you follow up even a year later responding to comments! I don’t have a bundt pan. Do you think it would come out okay in a 9×13 pan if I reduce cooking time to account for the different thickness? I am thinking of making this for a cake social and/or Thanksgiving. I made a similar cake tonight, but with 1/2 cup cocoa and no pie spices. We did like the cake, but agreed we couldn’t taste the pumpkin. Your recipe may be more of what we were hoping for. Yes, I think it would come out fine, though it is a more dense cake so hopefully you’d be OK with that in a non-bundt cake form (lol). I do hope you enjoy it! I just came back from the cake social, and I have to share with you that I won a prize for the best cake with an unusual ingredient! (the vinegar) I ended up trying my 10 inch spring-form pan, which left the center a little runny. But otherwise, it got rave reviews — including from a former professional baker! Most people were shocked at how moist and flavorful this dairy-free cake was. Thanks again! I’ve made this twice without cocoa and it’s entirely unneccessary. I also used sparkling water in place of regular water to give it a little extra air. It was a dense the first time I made this with regular tap water. But the sparkling water really helped make it lighter. I highly recommend it. Your batter will look a bit curdy with the sparkling water, but the bakes result should look the same, only more holey. Also, this recipe was a huge hit! Thanks for posting. We have egg allergies in our family, so it’s helpful to find vegan recipes on the internet. Thank you so much for the great feedback! I got the recipe from a friend and thought the cocoa powder was weird, so I had to keep it in (because I’m weird-haha). I did think it was very dense so thanks for the tip on the sparkling water. Glad you guys liked it with the modifications! I just made this for my sister’s birthday – and it was a huge hit! I omitted the cocoa powder, and I didn’t have a bundt pan, so I split the batter between two round cake tins and baked for 45 minutes. (it might have needed a little less time – I’ll probably try 30 minutes and then check every five minutes when I make it again) Then, I layered the cakes with the icing. (I made a double batch and used the leftover to ice some cookies I made too) In spite of probably over baking and assembling the cake too soon, so it turned out messy, my sister said everyone they had over tonight loved it! :) That icing is also kind of insane. Thank you! I just put my cake in the oven. I omitted the cocoa so I’ll let you know what happens! Did you end up making it again without the cocoa? I have a grandson who had a very severe reaction to eggs last year and as I am thinking about Thanksgiving it occurred to me that pumpkin roll has eggs. I think I will try this recipe for the cake base any thoughts on this idea? This is an AMAZING recipe!! Thank you so much for sharing. I have multiple sclerosis and baking can be a challenge with limited mobility. My daughter had a wonderful time cooking with me and it was so easy to follow. I believe the cocoa is in the recipe by mistake: the original Wacky Cake is a chocolate one (and quite delicious)! I am not sure why so many people are omitting the cocoa powder. It isn’t for flavor. It is a binding agent which is needed since the cake is eggless. I just took mine out of the oven and the house smells heavenly.